I fell in love with embroidery at a very young age, watching both my mom and grandma stitch beautiful art. It's been such a joy to see embroidery, once again, coming back into the mainstream. Have you noticed it all around lately? Until then, I've been playing with a bit of embroidery in the craft room. I'm not exactly the needle + thread connoisseur like the ladies in my family, but I sure can work embossing paste. So I've got a cheat embroidery look for you today and it's as simple as can be. some cardstock, watercolor paper, or thick art journal paper - the weight of your paper will depend on how wet your paste is. The molding paste I use is rather dry, so it doesn't buckle or warp cardstock, and I love it for that reason. 1. Position the stencil over the card base, and secure it to your working surface with some tape. I use Post-It Labeling and Cover Up tape, and it works like a charm, leaving no sticky residue behind. It's easy to remove, and doesn't tear the paper either. 2. Once the surface is prepped, it's time to tint the embossing paste! To do this, make a few mounds on your palette, and then color each mound with a drop of a water-based re-inker color. For this card, I used Distress re-inkers in colors of Peeled Paint, Fossilized Amber, Abandoned Coral, and Peacock Feathers. 3. Lastly, apply the paste over the stencil with a palette knife, paying attention to alternate colors between leaves and flowers. Remove stencil and enjoy! For an ombre look, such as in the flowers below, partially mix your paste with color, and embrace the variation! 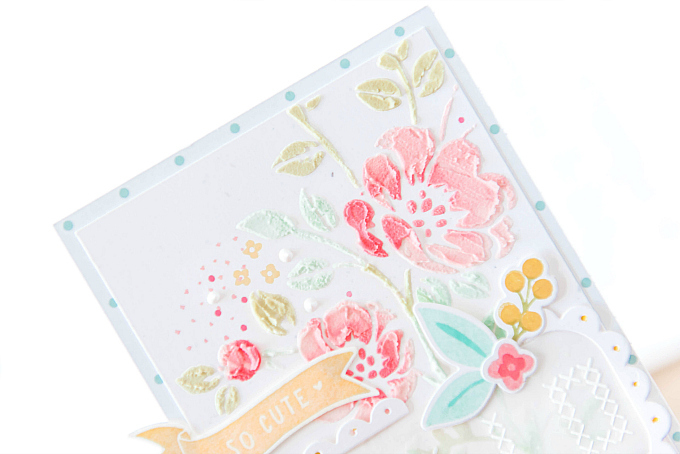 Once my background was all dry, I layered the 'embroidered' card base onto some polka dotted patterned paper, and stamped a few dots and miniature florals around the leaves, using the same colors of ink. 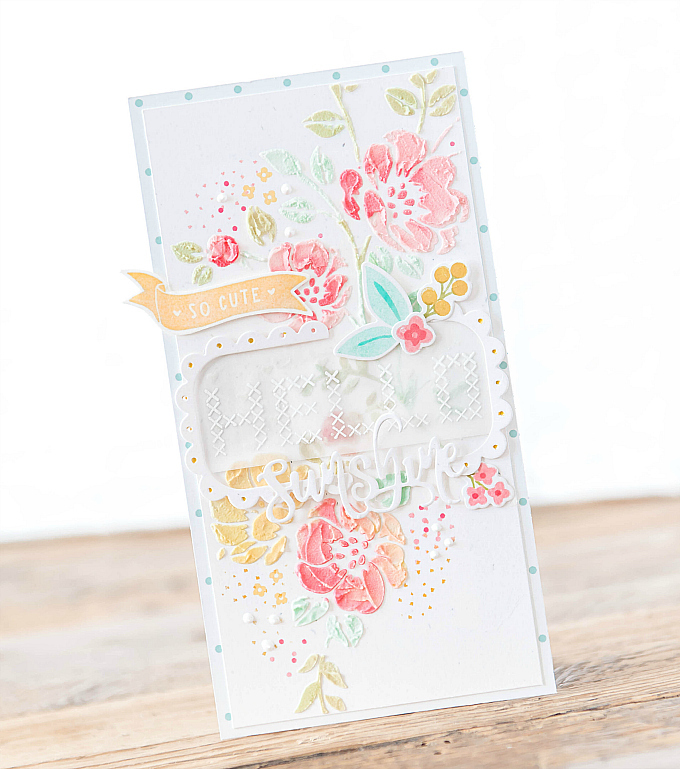 I added a floral cluster, stamped using Wplus9's Fresh Cut Florals stamps and dies. 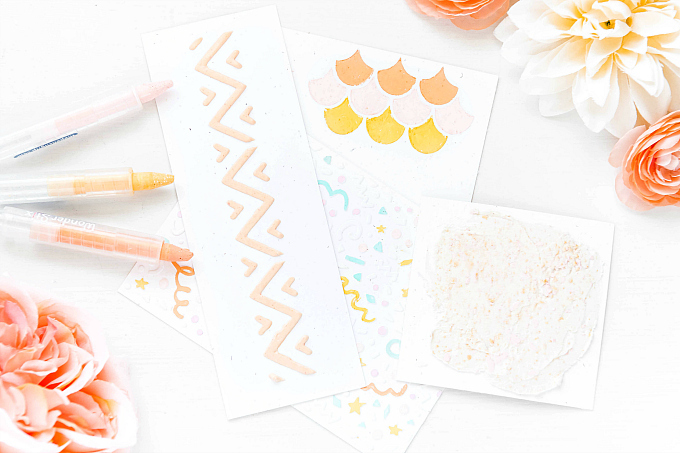 To the side, I added a fussy cut banner, stamped with Crate Paper's Little You stamp set, which is the sweetest, cutest little stamp! To the center, I added a sentiment, stamped on vellum, in a stitched font. I don't recall what set this sentiment is from, but I thought the stitched letters were perfect for this look, and I think the softness of the vellum and white embossing helps to not take attention away from the 'embroidery'. I framed the vellum with a scalloped border, cut using PTI's Tag Sale #10 die, and I colored the little dots with a yellow marker. At the bottom, I added some more stamped dots and tiny flowers, as well as a few liquid pearls. 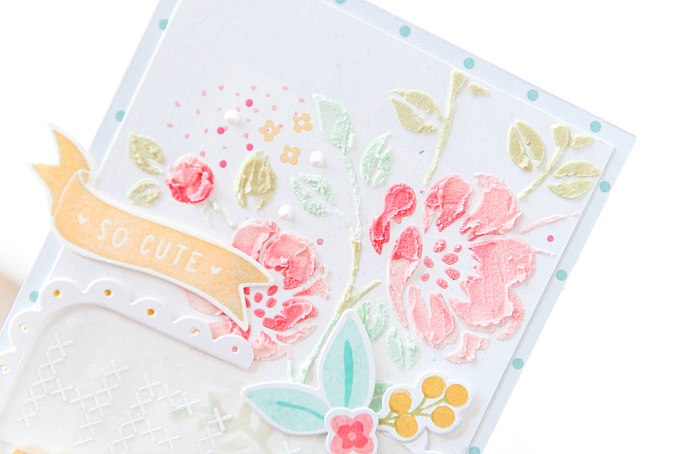 I'm loving the way this card turned out, and I think it's the perfect way to quickly fake an embroidered look. What do you think? Does it remind you of embroidery? 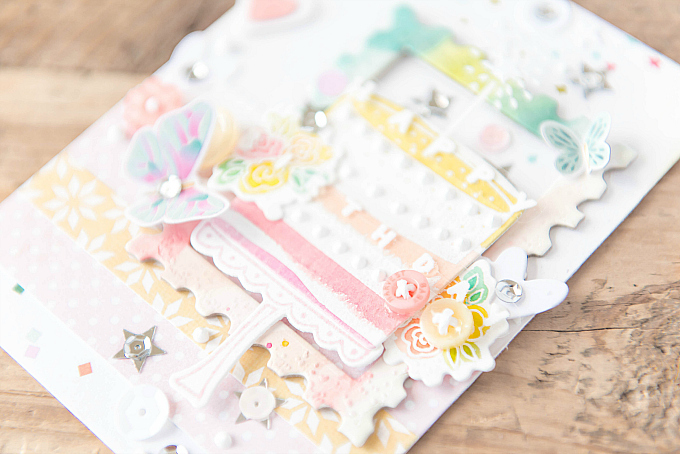 Before I head off, I wanted to share another card I created recently, using the April Monthly Challenge sketch inspo over on the Pinkfresh Blog. I thought the sketch was perfect for framing this fun, adorable cake, stamped with the Sweet Treats stamp set by Pinkfresh. 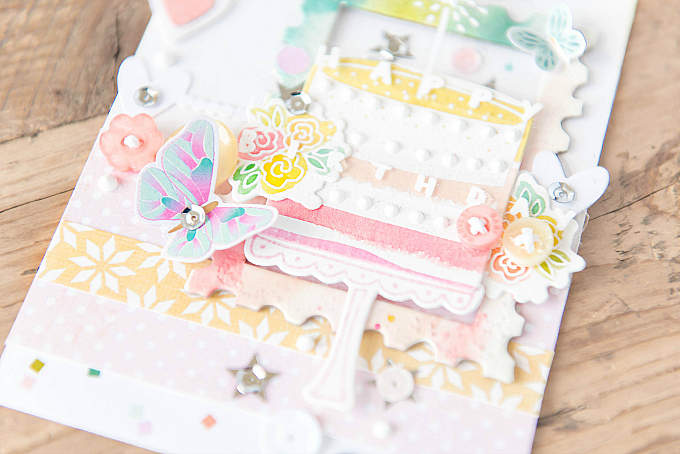 Because the cake was so colorful, I decided to just carry that theme throughout the whole card and create an explosion of colors and textures. This style is definitely a bit of a departure for me. I'm still not sure if I like so much detail...What do you all think?? I stared with a white card base. I used Distress Inks to color the chipboard frame in colors of Shabby Shutters, Peacock Feathers, Spun Sugar, Abandoned Coral and Fossilized Amber. I used the coordinating dies, to cut the cake and stand. Before stamping the cake layers, I watercolored my cardstock in a rainbow of stripes. Then I stamped two of the cake layers, embossing them in Ranger Fine Detail White embossing powder.. I added some liquid pearls to mimic delicate icing, and stamped the cake stand in a soft pink color. I stamped and embossed the cake sparkler and sentiment on acetate so that I could layer the bitty bits across the cake. I've recently been using heat-safe acetate that works wonders when embossed, and doesn't melt or buckle at all. 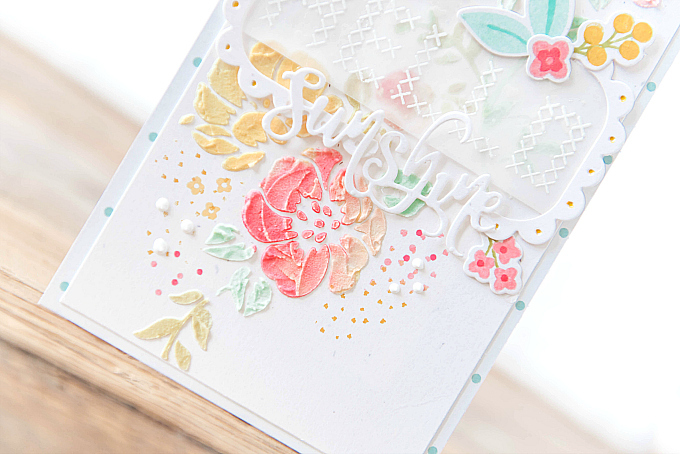 I absolutely love how it gives a look of floating, and allows me to add delicate details to any card. For all the little flower clusters, I loosely watercolored each one, using the same Distress Ink colors as I used for the frame. 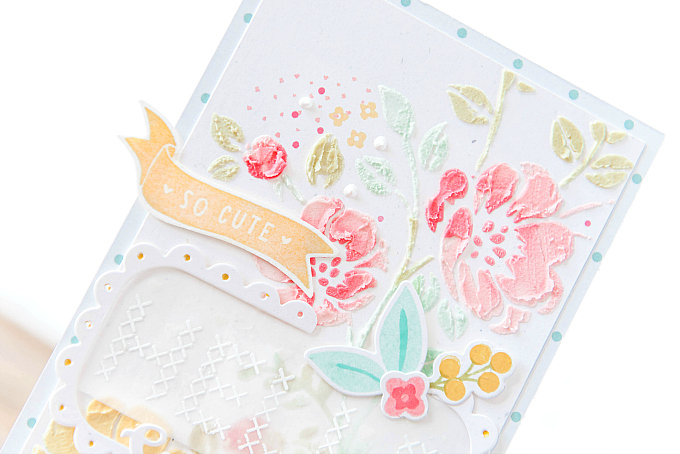 At the bottom of the card, I added some patterns - some dotted pink paper and a pretty yellow pattern. 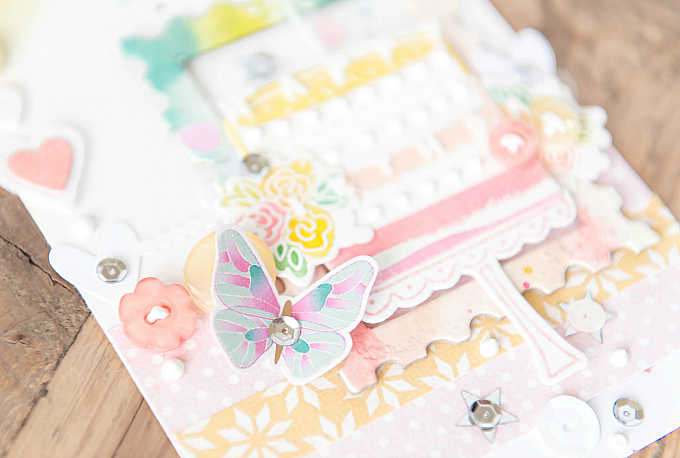 Along the side of the frame, I sprinkled on some buttons, fussy cut butterflies from Pink Paislee's Turn the Page collection, heart border from the PTI's Confetti Garlands, and oodles of sequins, liquid pearls and star stamps. As busy as this card is, it sort of makes me really happy! Ivana I believe these sets, with their tiny little details, were designed with you in mind! So beautiful, each in its own way... I totally am reminded of embroidery, using variegated thread! Aw thanks, Michele! :) Sending you a big hug! So beautiful - and I love all the girlie touches - so soft and romantic. What a talent you have! A big, heartfelt thank you, Dianne!! Sending you many hugs - hope it's not getting too hot there just yet! Your cards are absolutely beautiful!! I love your remake of the embroidery. On your second card I think you did a great job of all the detail so it works!! You have so many creative ideas. Thank you so much, Sadie! I'm so glad you think the second card works! I'm still not sure about it but it so wonderful to try new things! Sending you big hugs, my dear SK scrapping friend! Your cards are gorgeous Ivana!! Sooo lovely~ I like your technique with the paste! (wow girl! :) The texture is amazing. 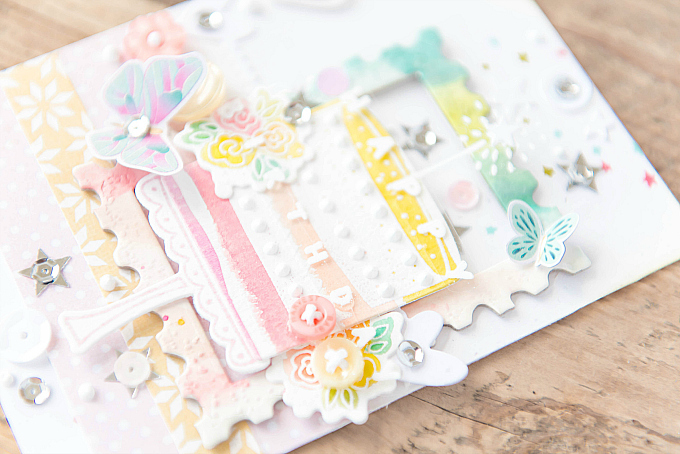 And the card you created for PinkFresh is Gorgeous! One of my very favorites~ Thanks for sharing. Really?!?! Karen, I'm so glad you like the Pinkfresh card! I was hesitant to even share it - but it's wonderful to just let loose and try new things! I'm so glad you like it :) Wishing you safe travels, dear friend, and hoping that you're ok.
Oh my, Ivana, I am drooling over these beauties!! I think the first one needs to be framed, it is such a masterpiece of color and textures. 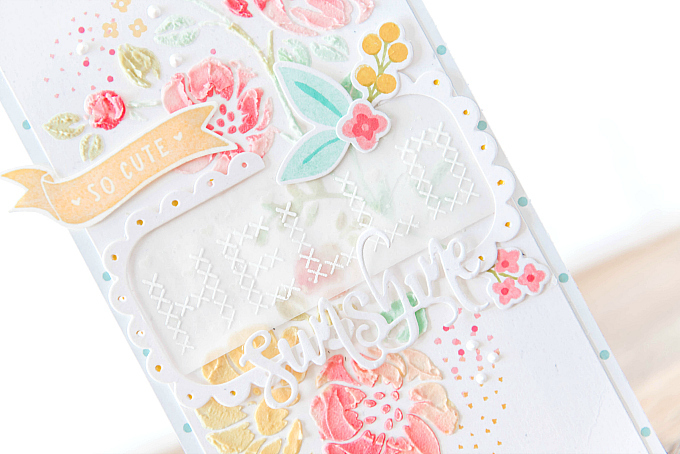 I love how you combined the textures paste stenciling with die cut flowers. Thanks for telling us how you did it too! Lovely, lovely designs. Aw, thank you SO much, Cindy!! What an incredibly kind and sweet compliment - I am blushing! Big, big thank you for visiting and for such kind words! Sending you hugs! Ivana!! Your cards are BREATHTAKING!! I LOVE your use of the paste on the first one. The flowers are just stunning!! The second one with the cake is just so yummy. Your designs are just stunning!!! Nora, thank you soooo much for the incredibly sweet and heartfelt note! I can't tell you how much you've made me smile! Thank you, dear crafty friend! These are both gorgeous!! Love the soft yet vibrant colors. Love your style. Even the one you say is not your style. Lol! Thanks for stopping by my place too. I am going to try to stop by here more often. Lots if inspiration here! Thank SO much, Lisa!! It means a lot to me that you like them :) And especially the second card! It's always a little scary to step outside the comfort zone, ya know? 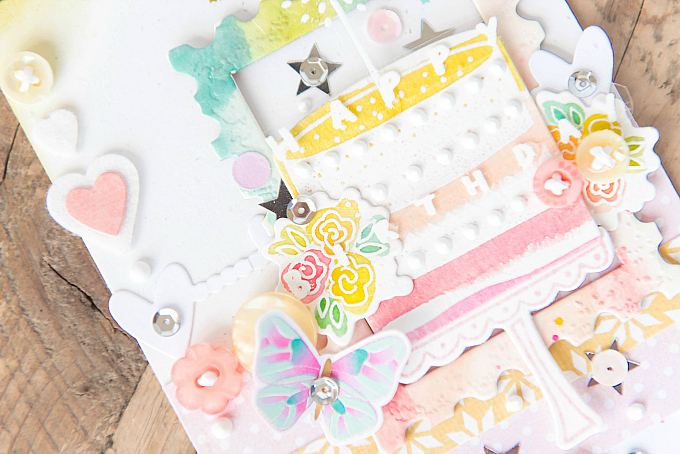 Gorgeous cards Ivana, especially like the fist one's texture! Such a wonderful work as always! These 2 are darlings! First one is very close to my heart because both my mom and her mom were embroiderin a lot in old times. I aslo love to do it but as you know...to many ideas...to little time ;) xoxo missing you!